It's a good thing I absolutely adore the lavender-vanilla combo - I've got enough of the stuff to last me a lifetime. Pour un homme is elegant and, for want of a better word, "noble" (as in "noblesse oblige") on a woman - even better on a man! Err ... would anybody like a decant? Dina - those large vats of PuH in the Caron boutique are really enjoyable to look at. They're soi large, I thought they were factices for a while. The mere thought of actually using that much of one scent intrigues me. I wouldn't mind having a big vat of this with the shagreen top - so gorgeous. As I [ever so] slowly accustom to lavender, I find the vanilla and slight woody/incense of these scents an important addition for me. I still have to be in a very particular mood to wear it, though. I find Impact to have more citrus in the opening, which helps. The vanilla/lavender thing can get slightly nauseating to me if I wear it on the wrong day. Dina and MD- thanks for the comments. The important thing here is that lavender comes before vanilla in both formulations; less sharp in Impact, but with slightly greater tenacity. I would like to have all the sizes, from the teeny teeny bottle (the sample) on up to the Big Bertha with the precious wood or shagreen cap. Dinazad - what a story! I had to go and find some 750ml-ish bottle to imagine your surprise better. If you realy want to get rid of some, I`d love to try Pour un Homme. I love lavender. I've been thinking of getting that one, I used up my sample and miss it. I read it also comes in parfum, called L'Impact pour Un Homme, even saw a tiny bottle on Ebay but was outbid:( Is that different from the EDP you're discussing? 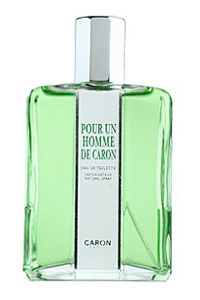 I prefer my Carons in parfum and was wondering if that would be true in this case as well. I'm in the club, too ! I love my bottle of this, and Impact, as well. Like our MD- she's a culinary wiz ! Dina- Happy to read your reference to our resident Swiss, Herr Tauer. It's funny ... I came to lavender through his Rêverie au Jardin (owing to its delicious strangeness) and now have the courage to venture into more traditional lavenders. That said, I've always loved the lavender-geranium coupling in fougère accords, like Penhaligon's English Fern. i adore this scent, and wear it myself. and i love, love, love to spritz my bed linens with it. makes for sweet dreams! i'll bet it's delicious on you! thanks for bringing it up. it's my favorite "lavender" by far. Veronica- Thanks for your question. L'Impact, on the face of things, is billed as "parfum." I guess I find a "pour homme" fragrance in such a category something of an anomaly, but this clearly has the power of one. It is in fact (one and the same) the EDP to which I refer.